by Rod Williams - I will not be buying Nike shoes since Colin Kaepernick is now their spokesman. Not that my not buying Nike will have an economic impact on the company. My "boycott" of Nike will be less than negligible. I just don't buy that many sneakers. I will not buy or wear Nike not to cause financial harm to Nike but as a matter of conscience. After this announcement by Nike, I went to my closet to see if I had any Nike's I needed to trash. I don't have any athletic shoe brand loyalty and did not even know what brand I was wearing. Thankfully, my shoes are not Nike, because I am frugal and hate to waste, and I would have hated to throw them out before they were worn out but I would have. I have two pair of tennis shoes, one pair is a Reebok and the other is Dr. Scholls. I had one pair of Nike socks which I will trash and they are almost new. whom they give discounts. I will never join AARP, but I am not going to boycott companies that give AARP members a discount. Life it too short to complicate it like that. Following the Parkland school shooting, there was a push by gun control advocates to pressure companies to drop their NRA association and some did. The "NRA association" did not amount to much really. Usually the "association" meant that NRA members got an insignificant discount if they presented their NRA membership card at the time of purchase. I don't remember if it was Delta Airlines or some other company, but one major company in a year's time had only awarded four NRA discounts. The reason is that usually only one discount can apply at a time and if you purchase through another party, such as Travelocity, you don't get any other discount. I bet most NRA members even think to present their NRA membership card and ask for a discount. In response to companies dropping their NRA discount, some conservatives mounted a boycott of companies like Delta airlines that had disassociated themselves from the NRA. I recently took a trip to Montreal, Canada and flew on Delta simply because it was the best and most convenient option. 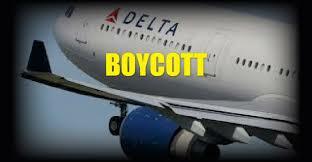 The supposed boycott of Delta did not enter into my calculation. Due to their bathroom policy some people boycott Target and lots of people boycott Starbucks but I forget the reason why. I don't do Starbucks, not because I am boycotting them, but because I think they are overpriced and there is other coffee just as good. So, my point is that I am not big on boycotts. However, Nike is different. By choosing Colin Kaepernick they have chose the person who started a movement to disrespect the flag. I do think people ought to have the right to disrespect the flag. I even think they should have a right to burn the flag if it is their own flag. The first amendment should extend to symbolic speech and flag burning is symbolic speech. The flag itself is not a sacred icon but a symbol and while I find burning it or disrespecting it offensive, free speech means sometimes people may do or say something that offends you. That doesn't mean that you have to respect them or associate with them. Nike has taken sides and proudly aligned itself with those who disrespect the flag. The logic of the move to show disrespect for the flag is that it somehow protest alleged police brutality. "Taking a knee," is to support the Black Lives Matter movement. I get it. However, to choose this kind of protest to make your point is so very offensive to me. I am a patriot. I love my country and I pledge allegiance to the flag and and to the republic for which it stands. I take showing respect for the flag seriously. I sill can get goosebumps at patriotic displays. Nike may know their customers. Maybe this won't hurt them at all. I assume among many Blacks this will make Nike more popular. I perceive that many millennials and many other liberals, are slightly embarrassed by patriotic displays and find patriotism not much more than tribalism. They may view themselves as citizens of the world rather than America and see attachment to country as an embarrassing relic of a previous era of jingoism and irrational romanticism. They probably applaud Nike. As for me, I cannot respect someone or a company who disrespects the flag. If there was a rally to publicly burn your Nike's, I would attend and throw my Nike socks in the fire. I would feel good doing so.